In an effort to improve bitumen recovery at lower temperatures, some oil sands operators borrow a page from conventional mineral processing and inject compressed air into the front-end of the Hydrotransport line. Despite little evidence of improved recovery rates, here’s why more bubbles should indeed be a good thing. Low Energy Extraction (know as the LEE Process) was pioneered by Syncrude in the late 1990s. Much of that technology was loosely based on base-metals flotation, such as zinc, copper or lead. 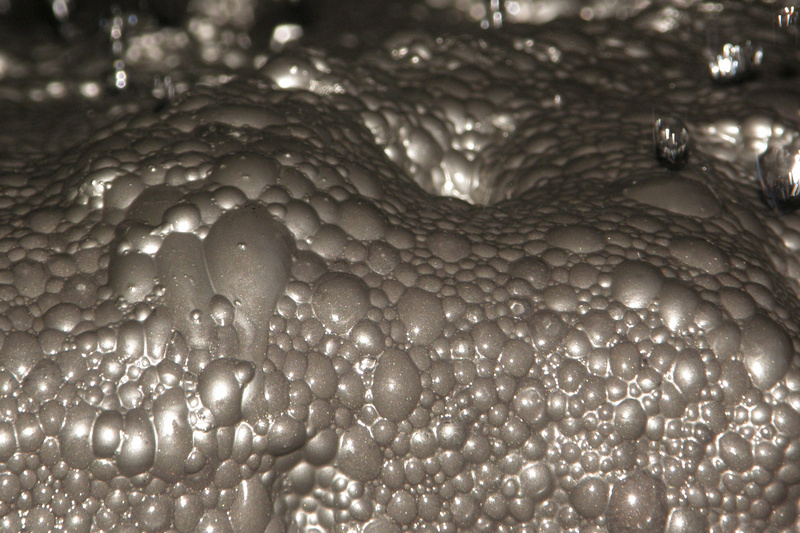 In base-metal flotation, tiny air bubbles are injected into the bottom of heavily-agitated flotation cells. The minerals then attach themselves to these air bubbles as they rise to the surface, enabling the mineral to be recovered off the top of the flotation cell. More tiny air bubbles generally equates to better mineral recovery rates. Since bitumen flotation works on very similar principles (bitumen attaches to air bubbles which rise to the surface and are subsequently recovered), intuitively, more air bubbles also makes sense for the oil sands. 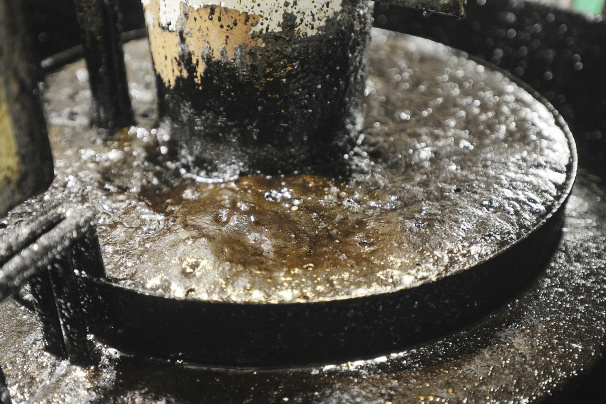 In Bitumen Production facilities, over 90% of all bitumen recovery occurs in a single, gravity-separation vessel (commonly termed the Primary Separation Cell) located within the Extraction plant. Air injection into this massive vessel was not deemed feasible. As an alternative, the LEE Process included the injection of air directly into the front-end of the Hydrotransport pipelines, using very large compressors. Sadly, after 15 years of compressed air injection into Hydrotransport pipelines across multiple oil sands facilities, there has yet to be any conclusive evidence of measurable improvements in bitumen recovery. Admittedly, Extraction performance is highly variable due to constantly changing feed quality from the mine. Small improvements in recovery are therefore very difficult to detect. Although bitumen recovery and mineral recovery look very similar on the surface, there are some very significant differences. Minerals are heavy, having a density much higher than water, giving them a tendency to sink. Mineral flotation therefore requires chemical additives to change the surface charge of the mineral being recovered, enabling them to attach to air bubbles. Frothers are also added to the process in order to stabilize the air bubbles, making sure they don’t burst as they rise to the surface. Mineral recovery is not possible without the help of multiple chemical modifiers which change the chemistry of the systems. Bitumen flotation is far easier. Bitumen has a relatively low density and is naturally hydrophobic (averse to water), giving it a strong tendency to attach to air bubbles and float to the surface. Oil sands slurry is naturally frothy and already very well aerated due to the vigorous mixing that occurs during slurry preparation. In fact, bitumen recovery rates are naturally quite high (normally about 90%) without the help of any chemicals or additives. It therefore makes sense that any benefit provided by injection of air bubbles would be nearly impossible to detect. Proponents of air injection admit that although the benefits are not easy to measure, intuitively, more aeration should be helpful to the process. Apart from added power consumption and the capital cost of installing large air compressors, air injection has no drawbacks. If opting to inject air into the slurry pipelines, designers and operators need to make sure all ABSA regulations are abided by with respect to containment of compressible fluids within a pipeline. Ideally, there should be no possibility of blocking in the section of pipe where the compressed air is injected. Also, slurry pumps do not take kindly to large volumes of air being drawn into the eye of the impeller, so compressors should be located a considerable distance upstream of the nearest pump. So if equipment cost and power consumption are not an issue, go ahead and add more air bubbles to the pipeline. It won't do any harm and might actually help the process.